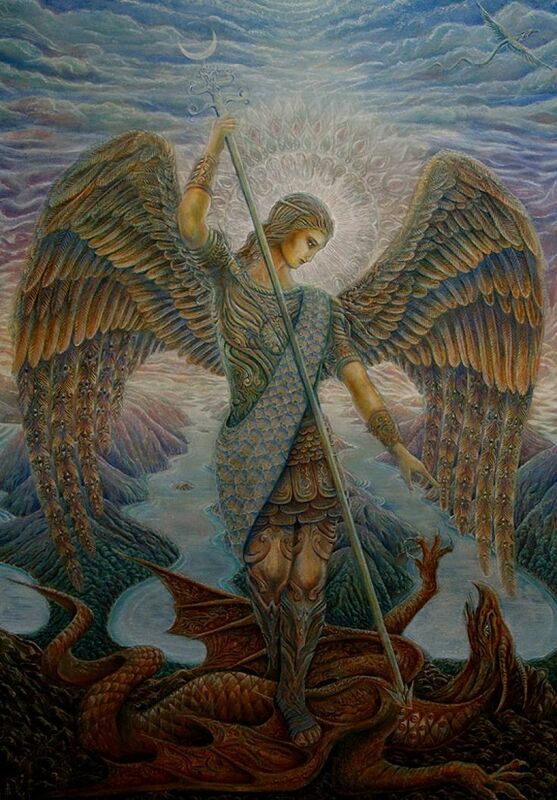 Image: “Archangel Michael,” by Daniel Mirante, https://i.pinimg.com/736x/6e/e4/64/6ee4646270d0de73d1fed3d717876e9c–saint-michael-michael-okeefe.jpg ..
What happens when we bow in obeisance to another person? When we do that, our Divine energy mingles with that of the other person. Our minds are clouded. Our pranic column energy (aka the energy of the pranic tube, the kundalini, the central vertical power current, the antahkarana, the silver cord, and the silver thread) is interrupted, and theirs is intact. A deep bow, such as in the image below, short circuits the energy of the heart, and links the ego with the sexual organs. 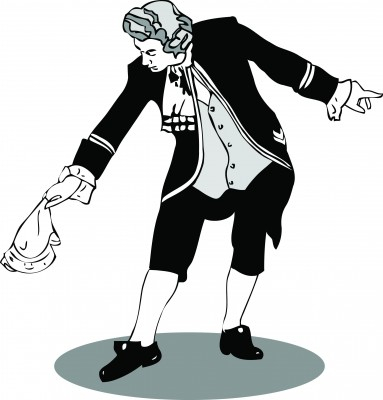 Image: Bowing before Royalty, http://leadershipcouples.com/wp-content/uploads/2013/03/Bowing-before-royalty.jpg .. 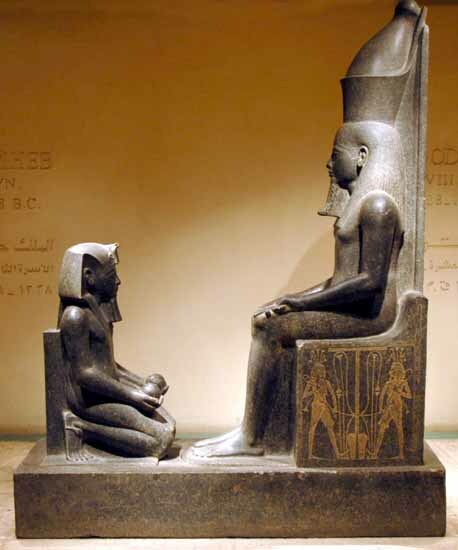 Image: King Horemheb kneeling before Atum, http://www.ancient-egypt.co.uk/luxor_museum/images/horemheb%2C%20before%20amun%204.jpg ..
What happens when we kneel or bow to a Divine principle, such as God or Christ? Image: Man kneeling in prayer, hands in prayer pose, head erect: https://www.polyvore.com/cgi/img-thing?.out=jpg&size=l&tid=22532105 .. Image: Hands in prayer pose, https://image.spreadshirtmedia.com/image-server/v1/designs/1005868649,width=178,height=178/praying-hands-prayers-35128154-606-938png.png ..
On Opening Our Pranic Columns to Divine Energy. With unbowed head, with spine vertical and muscles relaxed, and by simply placing our awareness on the brow point or the heart, I find we can receive 100% of Divine energy. Image: Pranic column energy of a man connecting to the Central Sun, https://iamofthestars.files.wordpress.com/2017/12/4bbd1-9.jpg ..
It’s all in the angles…. the angle of the spine in relation to Earth, the angle of the head, and where we ‘angle’ our awareness. The closer our awareness is to the core of our being… which is the inner sanctum of our personal Temple of the Holy Spirit, the greater the influx of Divine energy. This entry was posted in Central vertical power current - pranic tube - silver cord - antahkarana, Power over - powerlessness - service to self - service to others, Yoga and tagged angles, Antahkarana, bowing, central vertical power current, how to know God, kneeling, kundalini, Kundalini (see also 'Plane of Forces'), obeisance, power over, pranic column, pranic tube, prayer pose, silver cord, silver thread, Yoga, Yoga on 21 December 2017 by Alice B. Clagett.